Not sure exactly what to give that "Special Someone"? Looking for a special gift for a special occasion? 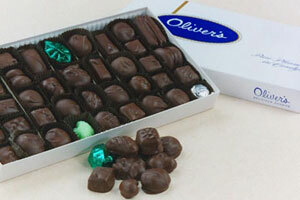 Everyone loves fine candy and a gift from Oliver's is a great and tasty way to show others you care. If you really want someone to remember you, try giving an Oliver's Gift Card. We guarantee they will be impressed and pleased. There are lots of days, occasions and ways to treat the people you love and care about with a delicious gift from Oliver's Candies! Your Oliver's Gift Card can even include special packaging such as tinware, glassware, baskets and mugs. We can even include an adorable stuffed toy in your selection for your Sweetheart or that special little guy or gal in your life. Ask our Customer Service people for more suggestions when you call or e-mail to order your Oliver's Gift Card. Our Customer Service people are happy to help you make just the right selection. We'll be happy to include a personalized Gift Card from you at no extra charge, and, if you prefer to order by phone, fax, e-mail or snail mail, we can ship your Oliver's Gift Card right now through our web site, or if you live near us or are visiting the area, you're always welcome to stop by our store and purchase your Gift Card in person! Oliver's Gift Cards are "good forever" - no expiration dates! Currently Oliver's Gift Cards cannot be used on our website due to different processing companies. But using the number on the back of the card (like a credit card) you can call the order into us at 1-800-924-3879. Click here to Purchase Oliver's Gift Cards!